We should be asking WHY the Lancashire Teaching hospital NHS foundation trust sold-off the urgent care centres contract to a non-profit company, after all, we could argue the NHS is non-profit. Here's a home truth: private companies have been circling the NHS for decades waiting to get their hands on NHS contracts and estate. 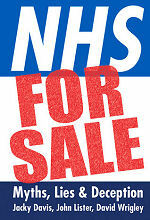 Bidding for an NHS contract as a 'for-profit' company would reduce their chance of winning the contract. So they front a company as not-for-profit/non-profit and either hide the for-profit parent company as a trust or subsidiary or simply start-up as not-for-profit then switch to profit making when the time is right (by contract exchange/renewal). *This is what's likely to happen in Central Lancashire once the bulk of NHS estate and contracts have been signed over to other companies next year under the STP plans (our health, our care for example). There are other methods of switching but many don't need to switch from not-for-profit/non-profit at all since they can make a profit from their business ventures in other ways. For example, tax-exempt non-profit companies often make money as a result of their activities and use it to cover expenses. In fact, this income is essential to an organisation's survival. As long as a non-profit's activities are associated with the non-profit's purpose, any profit made from them isn't taxable. There are many other ways to make a profit from a non-profit social enterprise/business, And what's to stop services being sub-contracted out? If it aint accounted for in the contract, it can be done. 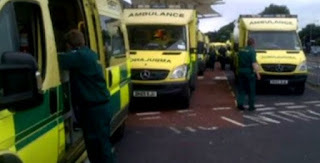 But for now we should concentrate on how the NHS A&E is going to work alongside such a company as GTD healthcare. As suspected, the 5 year contract deal, sold-off by the local CCGs has backfired. The original contract was to provide the services to populations from facilities co located with the Emergency Departments (ED) of Lancashire Teaching Hospitals NHS Foundation Trust at Royal Preston and Chorley District Hospitals. But since the Chorley hospital no longer had an A&E, the contract needed some amendments. To appease GTD healthcare, a scheme may have been designed that satisfies the above contract; albeit on a 12 hour part-time basis (ironic considering the trust chief executive Karen Partington argued at earlier board meetings the A&E must be 14 hours opening as per NHS England's guidance). The 14hour/12 hour A&E opening issue is the likely reason the independent report was bounded back and forth before its final release. Someone's been telling porky pies, someone's been stalling the re-opening of Chorley A&E for quite some time and we can all guess who and why, But we'll come to that later....for now just remember these words 'our health our care'.